The Mercury Control Center (also known as building 1385 or simply MCC) provided control and coordination of all activities associated with the NASA's Project Mercury flight operation as well as the first Project Gemini flight, Gemini 3. It was located on the Cape Canaveral Air Force Station near Launch Complex 14. The facility was expanded in 1963 to support Project Gemini by contractor Pan American World Airways to provide more meeting space along with space for data analysis, and a large space for a new Gemini spacecraft trainer. The more complex requirements of later Gemini and Apollo flights forced control operations to move to a larger facility located in Houston, Texas, but the MCC continued to be used for training and meeting space until it was added as a historic tour stop on June 1, 1967 for public tours which continued through the mid-1990s. The MCC was organized into three rows and was smaller and simpler than subsequent control centers. It needed only support a mission of no more than 36 hours with a spacecraft less complex than those used on future missions. Positions included those for monitoring the spacecraft and astronauts during flight as well as positions for supporting the launch and recovery of the capsule. The MCC also featured a large backlit status map for display of the capsule position. 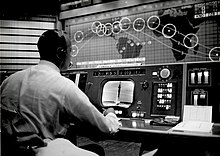 Unlike later mission control centers which featured computer generated graphics, this Mercury era display operated with a physical two-dimensional representation of the capsule suspended and lit in front of the map. More modern mission control centers were split between launch control, which is located at the launch site such as Cape Canaveral, and Mission Control which is located at the Lyndon B. Johnson Space Center for the Apollo and Space Shuttle programs or the Jet Propulsion Laboratory for unmanned missions. Though the MCC provided command and control, it was not the only facility involved in supporting Mercury or Gemini flights. The Computing and Communications Center was located at the Goddard Space Flight Center in Greenbelt Maryland and provided compute power for missions. The building was erected between 1956 and 1958 and was used throughout Project Mercury (1961–63) and for Project Gemini through Gemini 3 (1964–65). In 1999, much of the equipment and furnishings from the Flight Control Area were moved to the Visitor Complex where they became part of the exhibit there. They currently are on display to the public in the complex's Dr. Kurt H. Debus Conference Facility. Though the building was listed on the National Register of Historic Places on April 16, 1984, as a contributing property to Cape Canaveral Air Force Station, asbestos removal, other repairs and restoring the center to its original state would have cost $6 million. The decision was made to preserve the consoles and other equipment and destroy the building. In 1999, consoles, displays and other equipment were moved to the Kennedy Space Center Visitor Complex to a recreation of the MCC inside the Kurt Debus Center. Consoles and displays were reassembled and many are powered on. ^ "Mercury Mission Control, 1962-63 Addition". NASA. ^ a b Deming, Joan. "INVENTORY OF HISTORIC ARTIFACTS FROM THE MISSION CONTROL CENTER, CAPE CANAVERAL AIR FORCE STATION, BREVARD COUNTY, FLORIDA" (PDF). Archaeological Consultants, Inc.
^ "NASA's first Mission Control demolished". Collect Space. ^ "Mission Control Center". NASA / State of Florida. ^ "Mercury Control Center Room". NASA Edge. This page was last edited on 28 March 2019, at 19:00 (UTC).